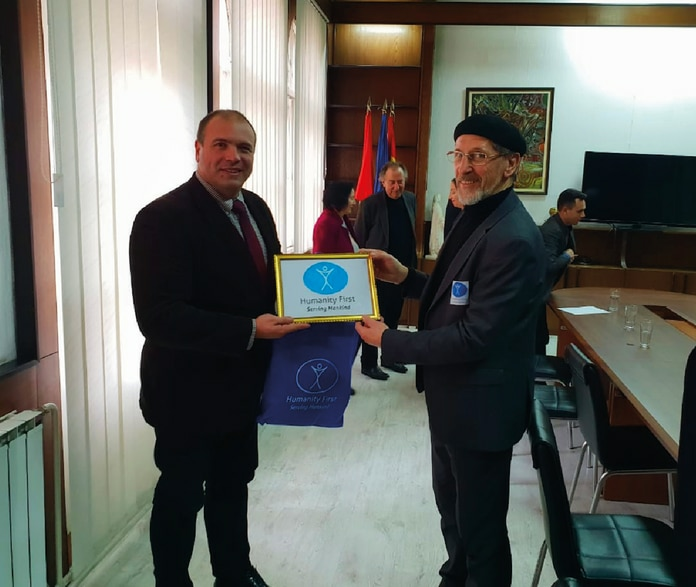 In a festive ceremony organised by the mayor of the municipality of Kumanovo, Macedonia, on 22 January 2019, Abdullah Wagishauser Sahib, National Amir of Jamaat-e-Ahmadiyya Germany officially handed over a van specially designed to transport disabled children. With special permission from Hazrat Amirul Momineen, Khalifatul Masih Vaa, Abdullah Wagishauser Sahib arrived in Kumanovo travelling by road from Pristine, Kosovo. At the occasion of Jalsa Salana Germany 2018, Mr Maksim Dimitrievski, Mayor of Kumanovo visited Germany. There he met with the chairman of Humanity First and requested a van for transporting disabled children in his city. According to the mayor, there are 800 disabled children in the city of over 100,000 residents. Daily, over 100 disabled children visit various schools. The request was approved and a suitable van was purchased and sent to Macedonia. Media representatives were present to cover the donation. While speaking on the occasion, Amir Sahib Germany introduced the Ahmadiyya Muslim Jamaat. He explained the two goals of the Jamaat – worshipping Allah and serving His creation – as mentioned by the founder of the Ahmadiyya Movement in Islam. Abdullah Wagishasuer Sahib told the media that the Ahmadiyya Jamaat on one side was making all efforts for mankind to turn towards God, while at the same time, through efforts like Humanity First, was making huge efforts to serve mankind. The mayor of the city, in his statement, applauded the worldwide peace efforts made by Hazrat Khalifatul Masih Vaa. He also praised the positive contribution of Ahmadi Muslims living in his city and offered his deepest thanks and gratitude for the valuable donation of a van, which would transport some of the many disabled children to their schools. Though it was a small donation in the form of a van, but due to this official event organised in the premises of the municipality offices, many media representatives had covered the event causing the message of Islam Ahmadiyyat to reach thousands of local residents. Alhamdolillah.